We are so happy to announce the publication of our 10th Hamilton Troll book, our second book award, for Best Educational Children’s Series, as well as our Hamilton Troll Curriculum. We have been hard at work creating and marketing this series. We want you to know how much your children will love Hamilton Troll so you can find the author every weekend at some event. Kathleen’s events calendar gets updated regularly, showcasing details regarding the shows she will be at. Find her at Market Days across Texas, craft shows, church bazaars, book signings, school readings and any place she can set up a table and talk about the series. 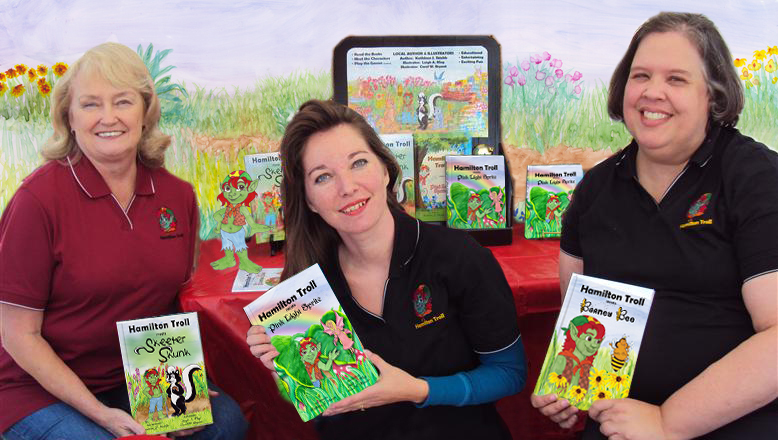 Carol W. Bryant and Leigh A. Klug are always hard at work painting or drawing the characters and world of Hamilton Troll – their imaginations soar with ideas and inspiration for scenes, poses and future stories and activities. We are a team of three different generations that work well together, expressing our artistic talents any way we can.